“I don’t have to work with people.” True. “Would you work with me?” I asked. I got my travel mug of tea ready and sat down at the breakfast table next to my oldest who was shoveling the cereal into his mouth and enthralled with ESPN. “Well, what do you think?” I knew he hadn’t heard the conversation with Hubs. He took his eyes off the screen just long enough to muffle the words “You still sound sick,” and went back to his feast. Welcome to a household of males. So here I am. Trying to rest, let my body heal, and give the antibiotics one more day to kick in. I’m not very good at resting and Hubs says you aren’t truly resting if you’re looking at a screen. He might be right but he doesn’t “work with people,” particularly in a school with under aged people. This. Is. Resting. This spring wedding held at an art museum had timeless style with navy stripes and polka dots and accents of green and fresh flowers. 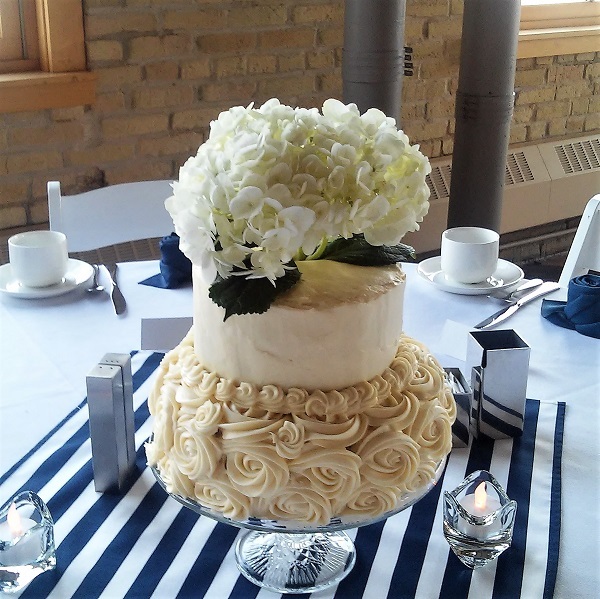 I don’t remember the cake flavor, honestly except that it had cream cheese frosting piped into rosettes on the base, a smooth top tier and a beautiful fresh hydrangea. 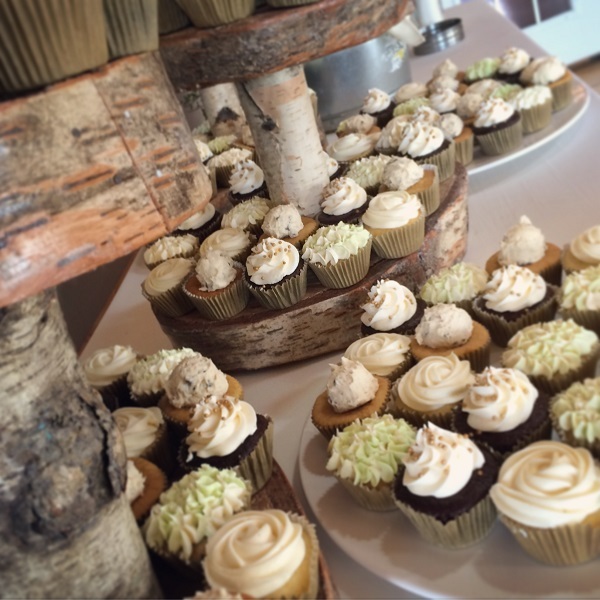 The cupcakes were just as classy. 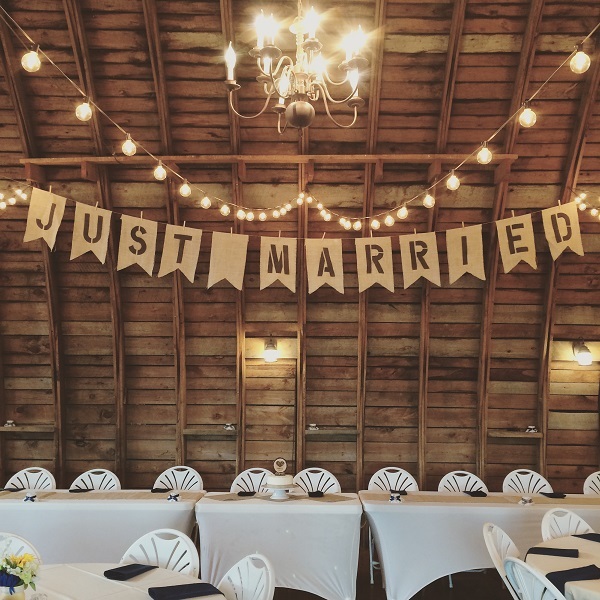 This renovated barn venue is easily my favorite to set up in. 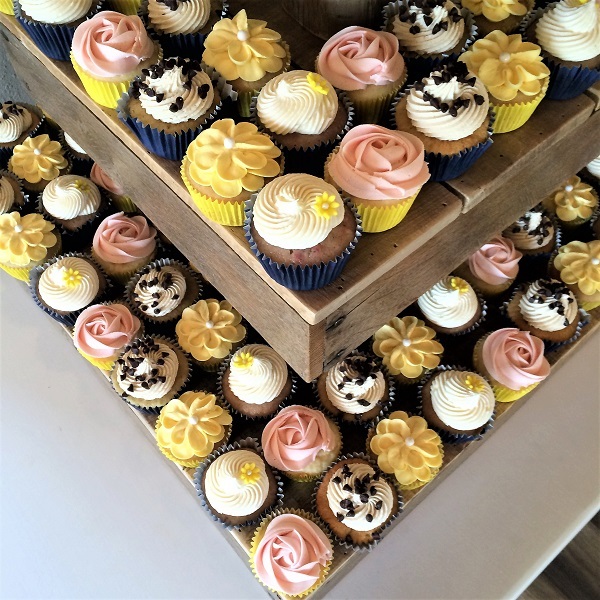 It has tons of natural light which makes photographing the cakes a breeze. And it’s just so darn pretty! There is nothing fancy about this cake. 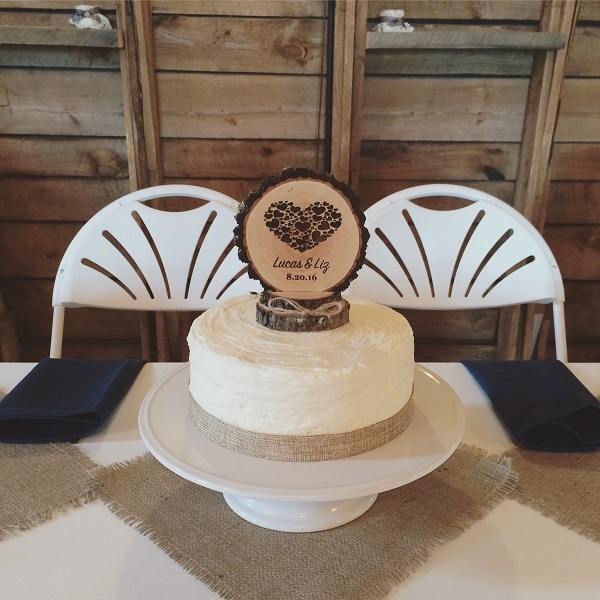 It’s a single tier, with textured sides, a burlap ribbon and a custom topper the couple ordered. But sometimes simple is just beautiful. 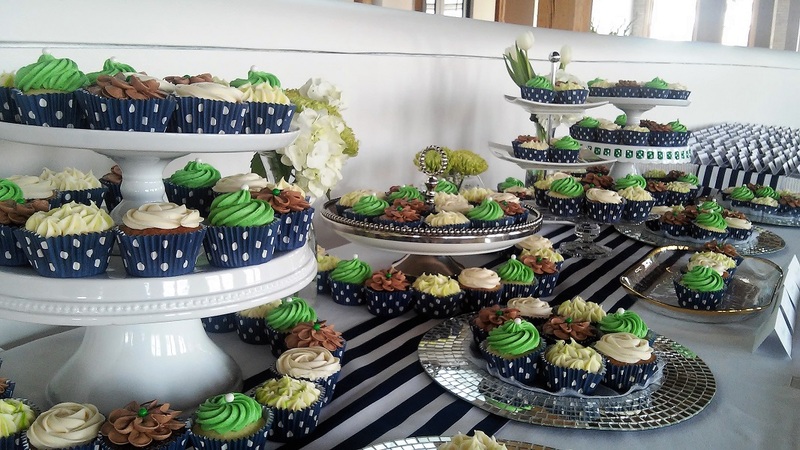 Besides, we fancied up the cupcakes to go with their sunflower and navy theme. 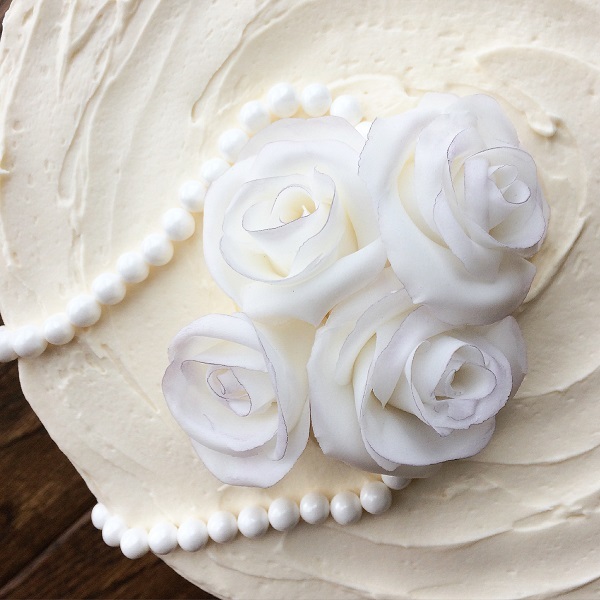 These roses were all handmade, petal by petal with fondant. I dusted the edges with a shimmering gray-purple powder as a nod to the wedding colors. 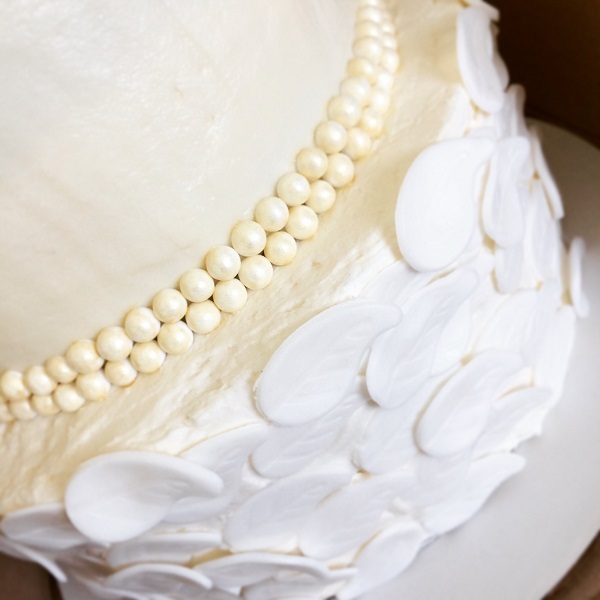 The string of pearls were made simply from lining up large sugar pearls. The hotel ballroom was decorated with pearls and lace and touch of rock n roll. I got to see the bride in her gorgeous sleeveless ballroom gown and showing off her half sleeve of tattoos. The mix of styles was perfect! I’ve done a couple of naked cakes now. They are always fun to dress up with fresh flowers. This wedding had no shortage of fresh flowers; there were literally buckets of them to choose from. 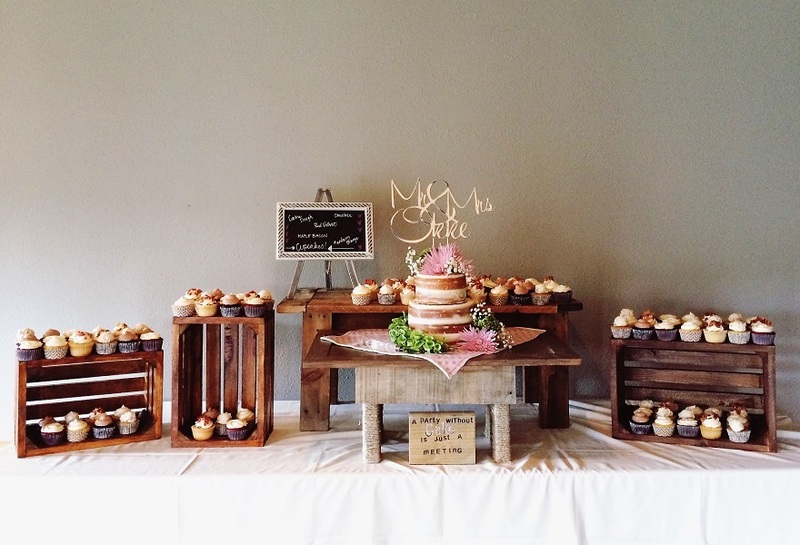 The colors were blush and gray and the crates display added to the cottage chic charm. It was, of course, beautiful. This wedding had lots of natural elements and mixed colors of moss green, gold, natural brown, ivory and white to complete the style. 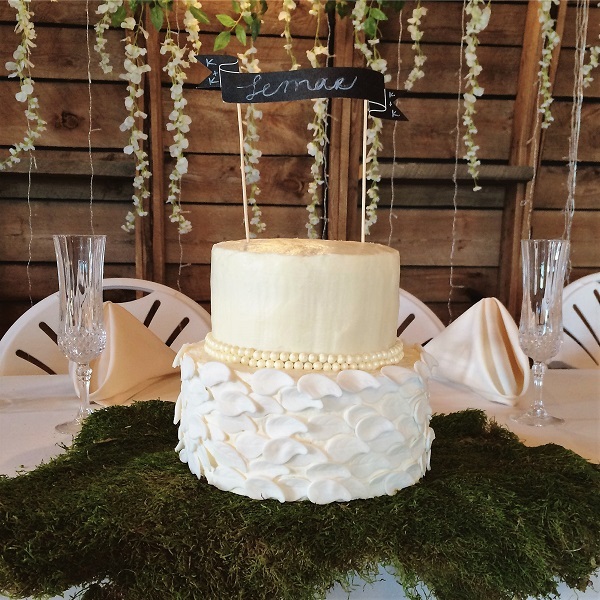 The leaves on the base of this cake were fondant embossed with veining. The sugar pearls were painted with gold luster dust and vodka. 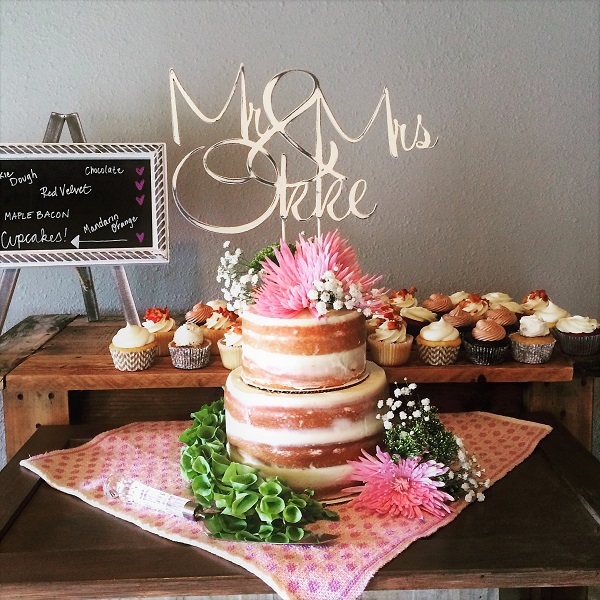 The cake was displayed on top of a layer of real moss and topped with a simple chalkboard banner. 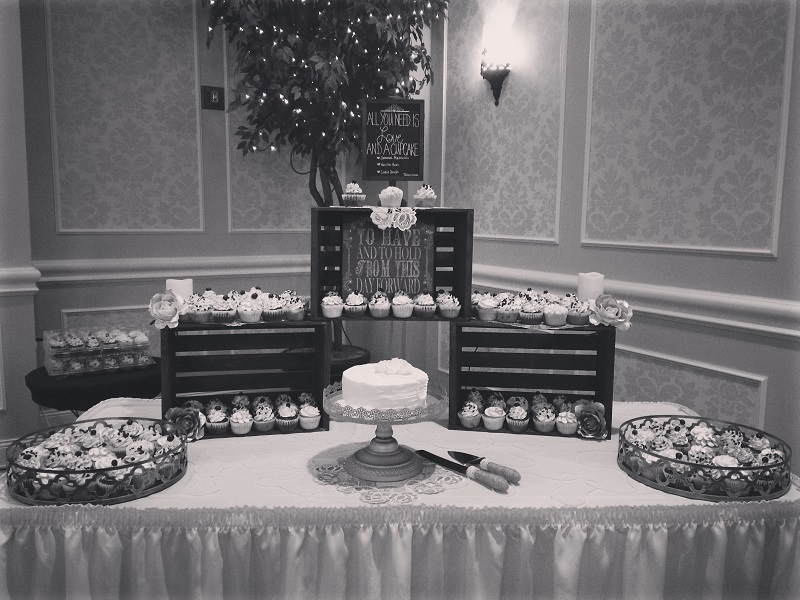 The cupcakes on wood cut tiers tied everything together. I’ve said it so many times before but it still holds true: I HAVE THE BEST CLIENTS EVER!! I can’t wait to see what my 2017 brides bring to the table! Now if you’ll excuse me, I need to go make more chicken noodle soup.